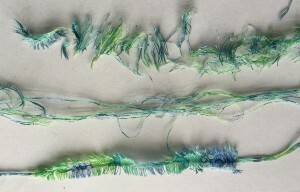 4.2 Experimental yarns and concepts based on the colour chips from printed fabric exercise. 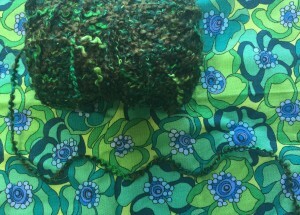 Such a surprise to find so many of my stashed yarns complement this fabric so well. 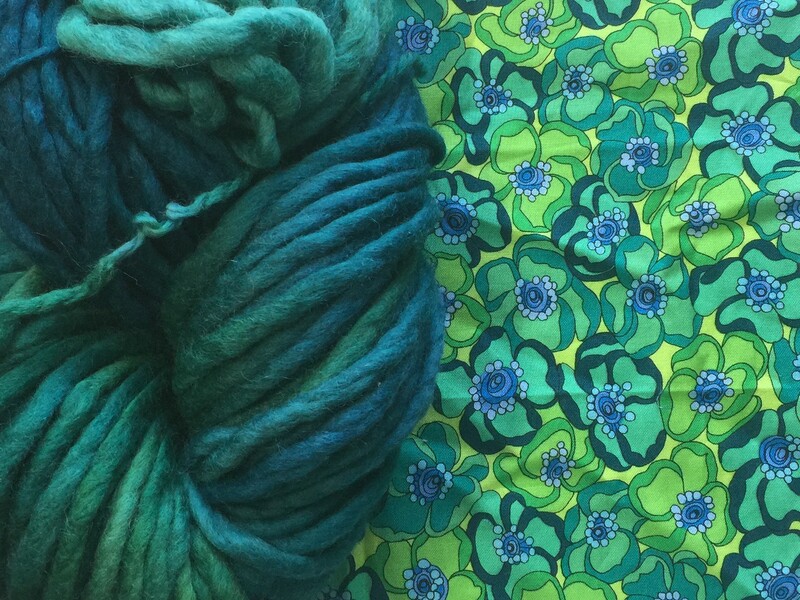 Though to be surprised is surprising given that I am partial to a palette of greens and blue.. 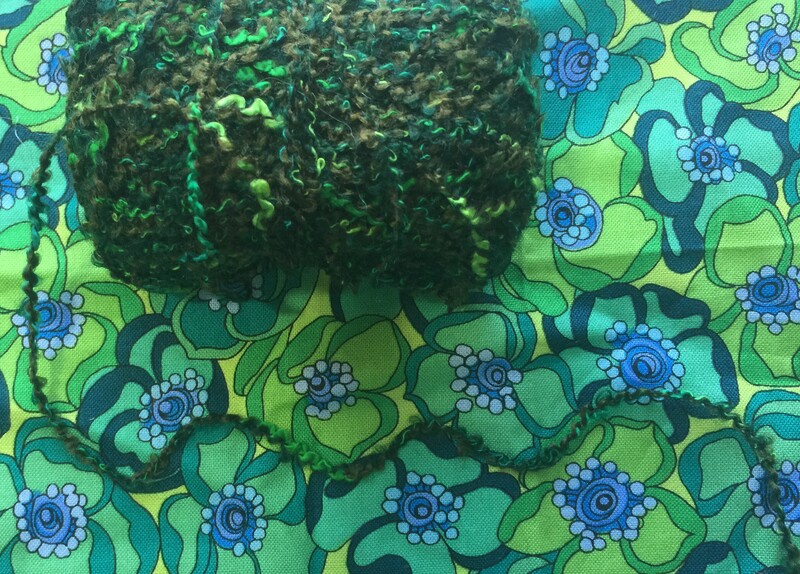 This yarn picks up the dark and bright greens , the addition of olive really mutes the joy of the palette, similar but on its best behaviour, the crinkled effect does remind me of the shapes of the flowers. 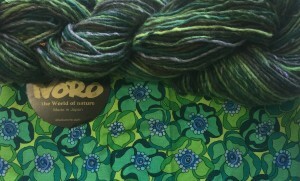 The Noro yarn incorporates the colours in chunks. This recycled sari silk has colours that match almost perfectly , they are mixed more thoroughly than the Noro wool. Using a strip of the sample fabric and plying it with a black thread seemed like a place to start. Exact colours, pleasingly spaced, even rhythm like the fabric pattern . Not particularly revolutionary though! 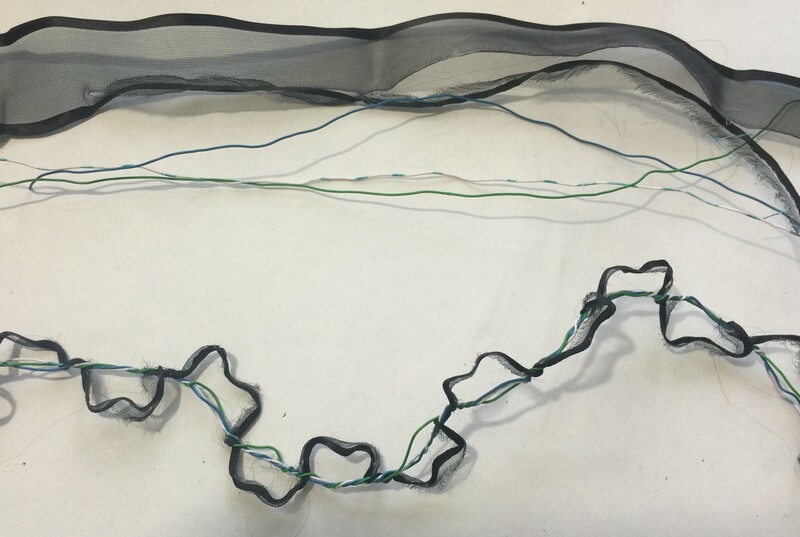 So not an exciting yarn but a possible useful solution for future applications, definitely usable. 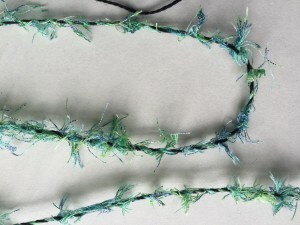 Using the hemp strings, I used the stronger structure to emulate the petal shapes. 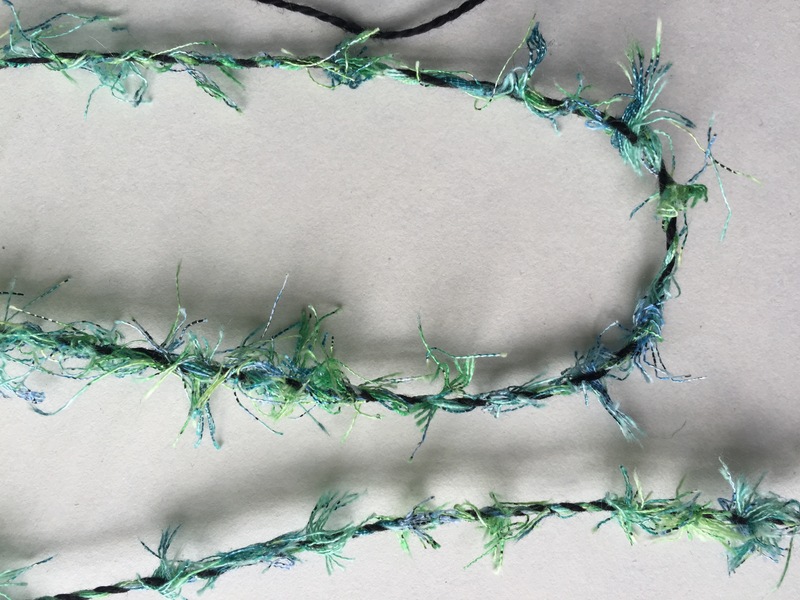 The blue thread alternated with mauve, was used as a wrap to represent the dots in the flower centres, I pulled them tighter than the other strings to relieve the tension in the other colours , this allowed them to form wavy shapes that emulate the printed pattern quite successfully. The wire gives good form, softened by the frayed ripped edge of the ribbon, I like the different negative spaces, and the light and dark shadows that are cast. I became very aware of the impact of shadows at the Traces of life exhibition in Dalarnas, Sweden. To me shadows allude to further layers of meaning, they invite further thought, elusive, ethereal, changing with time. The coarseness or fineness of a surface are equally about a visual sense as a tactile one. Deconstruction- Reconstruction –Checking through my handbook the concept of deconstruction -reconstruction leaped out at me. My desk is looking a bit messy now and I was wondering what to do with a frayed bit of the fabric. I had pulled off a few threads and admired how they held just a trace of printed colour. In terms of colour match they couldn’t be more perfect, but so fragile. One of the yarns I found in my first investigation is very fluffy, with the fluff seemingly trapped in the ply of the yarn. I needed to try to reconstruct it using perfect colours. It took some time to carefully de-construct the fabric and separate the warp and weft. I liked the effect when there were only a few warp threads left holding the perfectly aligned weft. 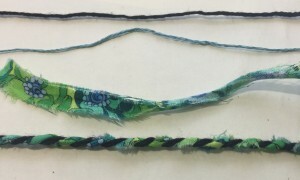 By laying the warp threads, ensuring that they overlapped I used my spindle to make a single ply of printed strands. 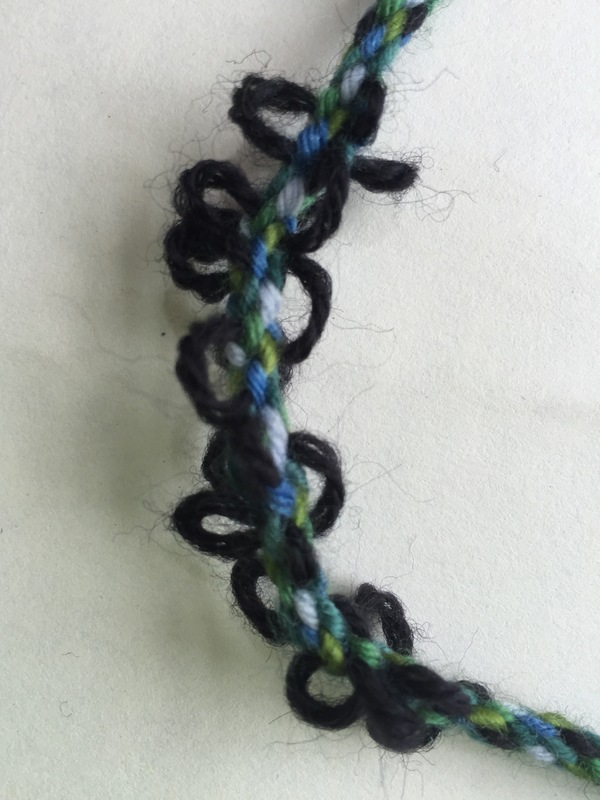 I added some more twist to some cotton pearle and then played them together adding a tiny bit of weft every couple of twists. I’m frankly delighted with the result! Thinking back to the sari silk yarns I wanted to produce a more thorough mix of colours so I used a Japanese technique, using a selection of wool yarns. 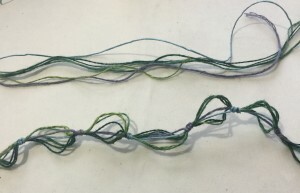 I came across a Japanese technique called Kumihimo at school recently, and immediately saw the value for mixing colours together, rather like a tweed fabric, but much more even than tweed yarn. A slow meditative process, I experimented a little along the length by playing with tension- trying to capture the rhythm of the printed pattern . I’m really quite fascinated with this playing with form and structure and will revisit at some point. The rhythm is like a story or piece of music, changing in tempo and form , the green ripples a different emotion to the black. I’m really quite fascinated by this. 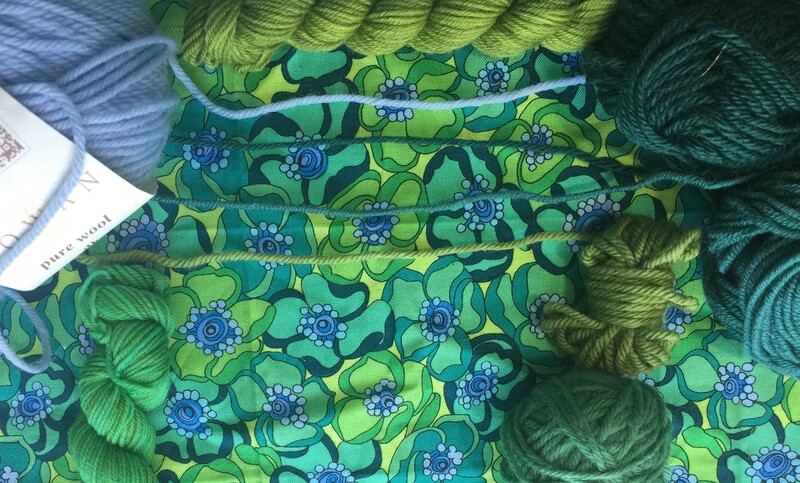 Thinking about the lines on the fabric that define the edges of the flowers I stitched a zig zag across a green ribbon and gathered it up. 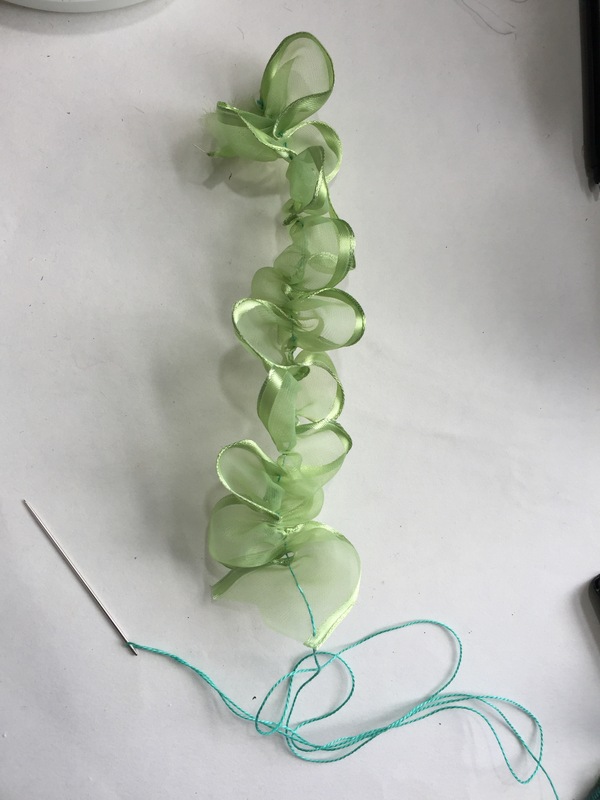 It really does emulate the idea of the flowers but I really do not like it, it is too frilly and i think that the ribbon edge is just too shiny. In the course notes it mentions making links with materials used in children’s toys. My brain processed this firstly as cut out paper dolls – I had some paper in similar colours to my fabric. I had recently been looking at the work of Tord Boontje and decided to try a garland of paper flowers. My first attempt was very solid, the second has a more pleasing drape and creates a lovely 3D shape. 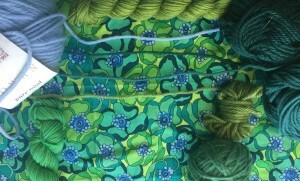 I used a section as a pattern and recreated it in rip stop nylon, bright, bold and a lovely filter of light. If I was to pursue this at some point I could laser cut the fabric and make hundreds of them. They look lovely hanging in the window. Lovely spring feel in this post – And a lot of suspense too. 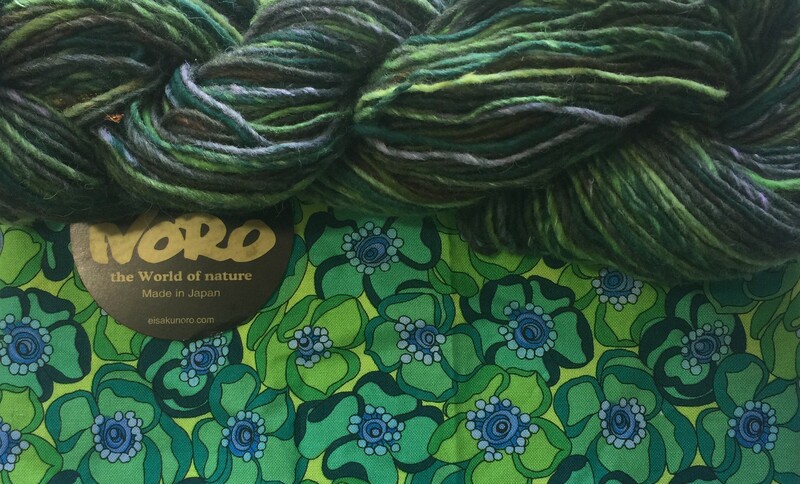 🙂 I am exited to learn more about the Japanese technique… I am also doing yarns section right now (only at 4.1 though). Thank you for popping by Inger! 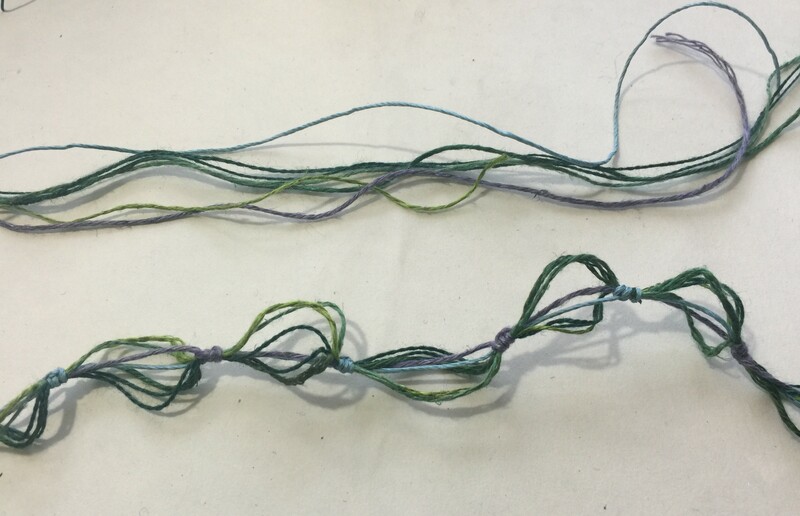 the Japanese technique is called Kumihimo, I’m really enjoying this assignment. 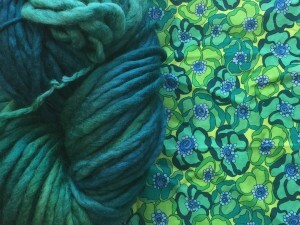 I’m supposed to be focussing on my blog detail and keep getting distracted by yarns though…. Hope you enjoy it too!